Adding narration to your courses is a great way to bring your e-learning content to life. And with Storyline 360, you don’t need to hire a professional voice actor or recruit a colleague to record your narration; you can quickly and easily create narration for your courses with the integrated text-to-speech feature. Storyline 360 automatically converts text into polished, natural-sounding audio narration. All you have to do is write the “script”—Storyline 360 does the rest! And with tons of narrator voices, you can choose one that has the right feel for your course. Text-to-speech also helps you create localized courses efficiently. Simply translate your narration text, then pick the language for your narrator to make sure the text is pronounced perfectly. As a bonus, you can automatically add closed captions to your course when you add narration. It’s really easy to record, update, and caption narration for your Storyline 360 courses using the text-to-speech feature. Let’s take a closer look at how it works. Using the text-to-speech feature in Storyline 360 is simple and intuitive. In Storyline 360, click on the Insert tab on the ribbon and click the Audio drop-down menu. There you’ll click on Text-to-Speech, select a language, and choose the voice you’d like to use. You can preview all the different voices to see which one works best for your course. If you’d like to automatically create closed captions for your narration, just check the option. You can convert up to 10,000 characters at a time by typing or pasting your text directly into the text entry field. 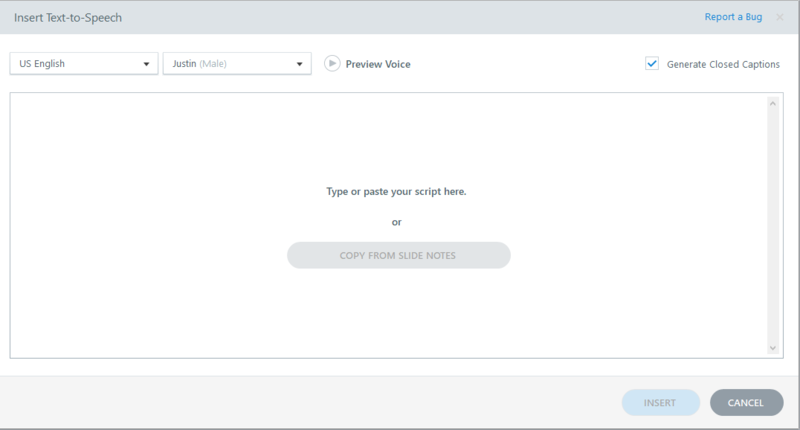 Using the Slide Notes area to store your narration script? We’ve got you covered. There’s a handy Copy from Slide Notes button that will bring over the text from your slide notes in one click. When you click the Insert button, the text in the field will be converted into an audio file, which will be inserted into the slide timeline as an audio object. If you need to make changes to the audio clip you’ve already created, simply right-click on the audio object in the timeline and select Text-to-Speech. You’ll see the original text and you can make your narration edits right there, which is a real time-saver. Text-to-speech makes it quick and easy for you to add the narration you need to your courses, in just a few clicks. Do you have any tips for using text-to-speech narration? Let us know in the comments below. Want to try something you learned here, but don’t have Articulate 360? Start a free trial, and come back to E-Learning Heroes regularly for more helpful advice on everything related to e-learning. If you have any questions, please share them in the comments. 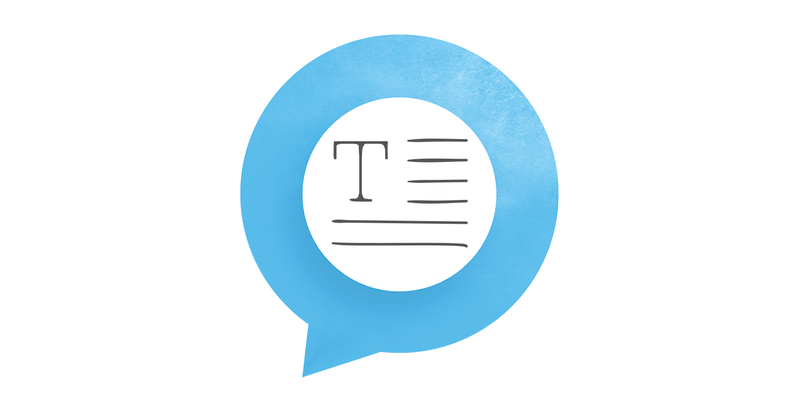 Congrats Articulate team on adding these new features to storyline. Any near-term plans on enabling text to speech for rise courses? M Vela a moment ago How about VTML coding to accentuate the speech, pitch, speed, breaks and pausing? Hi, I use Storyline 360 but I couldn't find this feature under Insert tab/ Audio drop down menu. Is this feature available in the existing Storyline 360 version? Hi Ali, You need to install the latest update to Storyline 360 to see the new features. If you go into your Articulate 360 desktop tray app, you should see a notification at the top letting you know there's an update available. Apply this update and then re-launch Storyline to see the new features. :) Hope this helps! Hi Any plans to add this feature to Storyline 3? I wish Articulate reconsiders just making this feature exclusive to Storyline 360 since you are about to alienate a lot of federal government agencies that use your software and by law have to comply with 508 compliance standards. Unfortunately a lot of government agencies especially Dept of Defense have strict rules about using web based software and allowing access to our networks especially in these times with all the hacking going on. With that said we will probably never upgrade to Storyline 360 do to network security concerns and it looks like Articulate's vision is on web based applications which we can't support. We will probably have to look at alternative authoring tools in the future which I am currently researching now as part of our agencies 3 yr plan. Carolos, you can get a natural voice software that does convert text to speech. You can search the Internet for free versions but that can be difficult as most truly free versions are not very good. You could use www.naturalreaders.com that has several voices to use and most of them are very good. You can also get licenses for groups of people. I use this with Storyline 3 and my clients like the results. Hello Jeffrey, thanks for your suggestion. I will look into NaturalReader software to see if it helps and meets the need of our organization. Hi Carlos! Thank you for your honest feedback. We do appreciate it and it does help inform the future decisions we make. And thanks Jeffrey for jumping in with a potential solution for this specific issue. Jeffrey, This sounds like a great solution. I went onto naturalreaders.com and attempted the trial but it just hangs....is this a reliable solution for you? Yes, this is a great solution for SL 2 and 3. I am on the second generation and the voices are much better. Not sure why it hangs for you. Try their support it is very good. we dont have 360 subscribed, but possible we can listen to a voice demo somewhere? Hi Jo! If you're interested in hearing the voices available in text-to-speech, you can download a free trial of Articulate 360 and give it a go! https://articulate.com/360 Follow the link and click the Free Trial button. Will the text-to-speech engine support VTML or SSML in the future to add emphasis, breaks, etc.? This is a great question from Henry. Will VTML be supported? Hello Guys. I just love the Text-to-Speech feature. THANK YOU. Just 2 questions. 1. Can you download more voices from Articulate? 2. Is there any way to speed up the voice? They seem to talk a bit slow? Many thanks. Christelle. the 360 version I have does not seem to have the text to speech function? Should it? Thank you for your feedback, Craig! I second that. Some kind of pronunciation editor is a must. Sometimes clients will not accept the work because of mispronounced words. We need a good tutorial on teaching the text-to-speech how to pronounce "custom" words - like company-specific product names! Does this tutorial already exist? Can you point me to it? Here's a hint - I kept trying things to get the pronunciation I need. There are two product names: "eCams" and "evoBrix" - both registered trademarks. I succeeded in getting the long "e" sound for each one in different ways: "eCams" sounded best when I had the system pronounce "eecams" (with double "e"s), but that didn't work for the same long-e sound for evoBrix - what did work was the double "i" from Hawaii - I spelled it "iivobricks" and it works. So if you're having the same challenges I have, keep trying - you can probably get it to work. Great tips, David! Thank you for sharing these. For extra "space" between words or sentences, try inserting carriage returns. Another tip I use in text-to-speech is I add a comma or period to break the speech. I always have a period at the end of a title or phrase if that is all I want spoken. I add a period to the end of all bullet points otherwise the voice keeps going. I use commas to break up the speech in a more normal way. Sometimes, I just break the voice to keep it from running on as it can do with a long sentence. You just have to experiment. Great tip, Jeffrey! Thanks for sharing your expertise with the community. How about VTML coding to accentuate the speech, pitch, speed, breaks and pausing? I would really like to be able to add VTML coding to ensure that the pace of the audio is more natural and conversational when using the text to speech feature. Is this something that will be available soon? Thank you! Hi Claire! Thank you for leaving your comment. I'm seeing from the comments that this feature is important to our customers. Please do leave a feature request here: https://articulate.com/support/contact/feature-request Thank you! I am already using Jeffrey's suggestions, which help a bit, but VTML will really hit this ball out of the park! Thank you for your comment Cathy. We really appreciate the feedback and I've passed along the word to our dev team that customers are asking for this feature :) So stay tuned! To add to this discussion, Tom Kuhlmann had this post in June 2017. https://blogs.articulate.com/rapid-elearning/amazon-free-text-speech/?utm_source=REL&utm_medium=Email&utm_campaign=RELFEED I used Natural Reader with Storyline 2 and now 3 and find the voices pretty good. Is this function available on Storyline 3? Hi Shile! This feature is currently only available in Storyline 360. Is there anyway to use this in RISE? Like the ability to export/publish just the audio that is created so I can then upload it to my RISE course? Thanks for the link, I've added this as a recommendation to RISE. I did however find a workaround :) in the meantime! I published the Storyline 360 in LMS format and then found the specific MP3 within the Storyline output folders. Then I uploaded the MP3 using the existing audio block. I want to echo Carlos' concerns and hope that Articulate reconsiders making certain features exclusive to Storyline 360. In addition to the federal agencies that he mentions, other companies, including many electric, gas, and water utilities, have strict rules about using web-based software. We've discussed Articulate 360 w/ our IT team and it's a no-go. Like Carlos' group, we will probably never upgrade to Storyline 360 due to network security concerns. LOVE this feature for my storyboarding and to estimate the course duration part of the narrated audio! I love it, it works better than other apps I visited. nevertheless, is there a way to add more voices to the library? I wish this feature was available in storyline 3 as well. Due to unreliable internet connectivity I ST 360 does not seem a good option to me. I plan to use ST 3. Would be glad if the text-to-speech feature was included in ST3. Is there a way to edit the text after it has been added? I didn't save the script and I forgot the word "and". I tried to open it, but it doesn't seem like you can edit it after it's been added. Yes, you can. Just click in audio options and text-to-speech. You can edit text and change duration of subtitles.